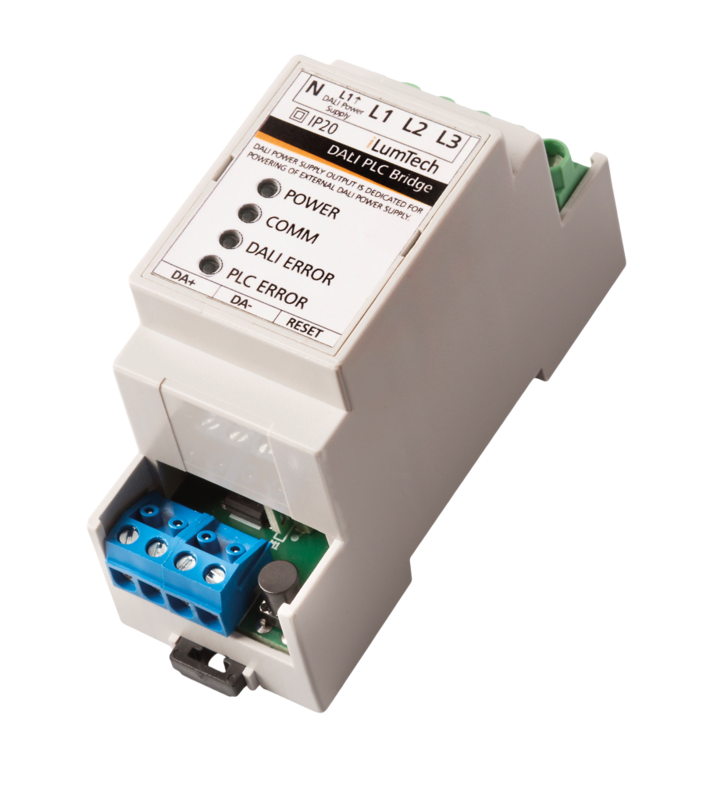 The iLumTech DALI PLC Bridge is part of the Connected Lighting product family. This powerful device is used to connected two or more DALI networks over standard mains cabling. Basically, the device couples DALI communication to the mains, and vice versa, which eliminates the need for installation of additional DALI cabling. This determines the DALI PLC Bridge for use is applications where two-wire cabling suitable for DALI is not present, and reconstruction is not planned or possible. The DALI wiring is not required between the DALI PLC couplers, in the case that the DALI coupler is used in front of the group of the luminaires, they have to be connected with the DALI wires. For the simplest DALI PLC networks, you need only one DALI PLC Bridge that acts as the master connected to several DALI PLC-IN devices. DALI PLC-IN devices are ideal for use where there is no possibility to add additional wiring as they are placed directly within luminaires and only need to be connected to the mains. Perfect for use in heritage buildings such as churches and cultural buildings as well as in places where the construction materials make it overly difficult to install new wiring within the walls and ceilings. It is possible to distribute such networks across one, two, or three phases as required. In some spaces, it may be viable to install DALI buses in some locations but not throughout the entire space. For such cases, DALI PLC is ideal to couple these various DALI buses via the mains wiring into a single network. Each DALI bus requires its own DALI Power Supply and DALI PLC Bridge device to connect it to the rest of the DALI PLC installation. This installation method is useful for spaces ranging from office buildings and hotels to shops and restaurants. It is possible to distribute such networks across one, two, or three phases as required. This installation method is very much the same as the previous except that it also includes DALI PLC-IN devices. Such a combination offers the greatest flexibility for positioning and controlling of luminaires within the network and is perfectly suited to use in office buildings, hotels, and even hospitals, where rooms or offices can be equipped with a DALI bus but the corridor requires lighting than runs off the mains. Of course, the principles of the installation method can be applied to almost any type of space. It is possible to distribute such networks across one, two, or three phases as required. For larger spaces or complexes like office buildings, factories, supermarkets, and warehouses, 64 DALI devices are simply not enough. Such buildings often use three phase wiring, which opens up the possibility to use each phase as a separate DALI PLC network with 64 DALI devices. Each phase must be used independently of the others in order for this to work and so must have its own DALI controllers and master DALI PLC Bridge device.